Rugs and carpets compliment home décor but they can curl, bunch and slip which could cause you to trip. 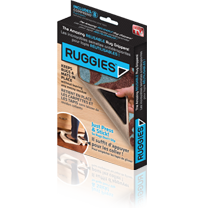 Ruggies are reusable rug grippers that keep rugs and mats in place and work on wood, tile and linoleum without leaving behind sticky residue. Simply place the non-skid pads under each corner of rugs and hundreds of suction pockets will grip the floor keeping rugs in place. They are reusable and interchangeable with any rug!